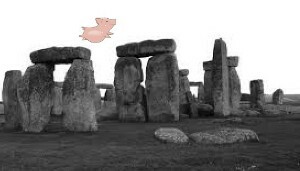 Myth 9: Numerous examples in Highways England consultation material suggest that the scheme will ‘enhance Stonehenge Outstanding Universal Value’ or the ‘World Heritage Site’ as if the stone monument is the sum total of Stonehenge WHS. The Stonehenge Alliance has submitted evidence to the select committee on fake news. Examples given in our response to consultation are summarised here. Stonehenge is not immune to fake news! Myth 8, 6 March 2018: Highways England claims scheme will remove the bottleneck and reduce rat running. See answer to Myth 1. When one tunnel is closed increased traffic through a single tunnel will cause worse congestion than at present. No traffic management through the villages is planned. Diverted traffic will not be prevented from rat running. Myths 3-7, 8 February 2018: English Heritage published a ‘mythbusting’ item as part of a joint press release on behalf of their partners, National Trust and Historic England. We respond to each myth in our blog Busting the mythbusters. Myth 1, March 2015: “Increasing road capacity will relieve congestion” is the mythical driver for this scheme. Download our statement here. See also CPRE’s video and report End of the Road? Challenging the Road Building Consensus.